I rarely make New Year's resolutions, but this year I am determined to harmonize my home. First on my list is organizing my jewelry collection. 2014 marked my fifth year of hosting and entering giveaways, so I've collected quite a bit of bling for free. The last (but not least) addition to arrive before the new year was these magnificent Mother of Pearl earrings by Rica Jewels. I'm taking the arrival as a good sign for 2015, because Mother of Pearl is said to attract prosperity. The shiny shell earrings certainly made me feel like a million bucks when I wore them on New Year's Eve! But I'm not bogarting all the good fortune to myself. 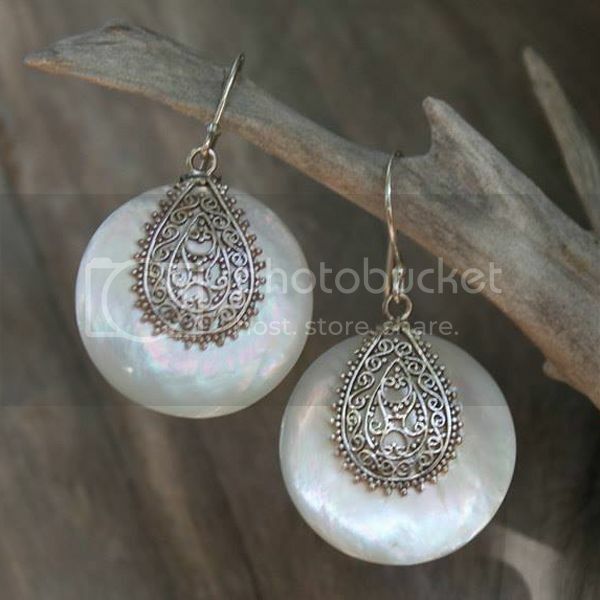 One of my readers will win another pair of Mother of Pearl earrings from Rica Jewels. Don't miss your chance to enter Jewelry Giveaway before January 10, 2015. Really amazing earrings! I am glad to see this nice piece. Thanks to share it. Wow! 2 of my favorite things - pearly surface and filigree. Adorable!